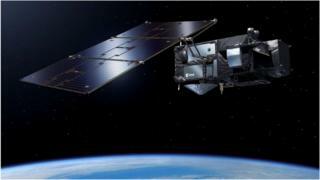 The European Union has launched its latest Sentinel Earth observation spacecraft. Sentinel-3b is a multipurpose satellite, but will concentrate much of its work over the oceans, monitoring their behaviour and health. The spacecraft went up on a converted intercontinental ballistic missile from Russia's Plesetsk Cosmodrome. It will join an identical platform, Sentinel-3a, which was sent into orbit two years ago. This is now the seventh satellite the EU has lofted in its ambitious Copernicus programme, which seeks to put the biggest volume of Earth observation data ever acquired into the hands of policymakers, scientists, businesses and the general public. Everything the Sentinels observe is open information that anyone in the world can access with a computer and an internet connection. The 3a and 3b missions have been designed to perform a wide variety of roles - everything from measuring the thickness of Arctic sea ice and monitoring wildfires, to assisting with hurricane-forecasting and identifying marine pollution. As with all the Sentinels, the procurement and early operation of 3b falls to the European Space Agency (Esa), the EU's technical agency for Copernicus. But for this new mission, Esa has decided to do something a little different. It has had the Russian Rokot launcher inject 3b just in front of 3a so that the performance of the pair's instruments can be directly compared as they fly over the same piece of Earth. "3b will fly 210km in front of 3a, 30 seconds in time; and that will allow them to acquire data over more or less the same ground track," explained Esa mission scientist Dr Craig Donlon. "We'll do this for 4.5 months and then we'll drift 3b back into a 140-degree orbit, 50 minutes apart," he told BBC News. This should eventually see two perfectly cross-calibrated spacecraft making neatly interleaved observations of the planet. Production of the Sentinel-3 series is led industrially from France, by Thales Alenia Space, but benefits from the contributions of 100 or so companies across Europe, including from the UK. Britain has had the core responsibility of testing the Sea and Land Surface Temperature Radiometers (SLSTR) on each spacecraft. The UK's involvement post-Brexit in the EU's flagship space programmes is currently the subject of much uncertainty, with future cooperation on the Galileo satellite-navigation system looking increasingly unlikely. But there is hope that Galileo's woes will not be mirrored by Copernicus. Britain stressed again on Wednesday its desire to stay in the Earth observation programme. And to emphasise this intent, the UK Space Agency trumpeted new Esa feasibility studies awarded to Britain to plan future Sentinels that would launch in the 2020s - some years after the nation will formally have departed the EU. Sam Gyimah, Science Minister, said: "The UK space sector is a success story and our capabilities in Earth observation satellite technology are second to none. These latest contracts confirm the vital role of British research, innovation and industry to Copernicus. "We’ve been clear that we want our companies and universities to continue participating in key EU space programmes, as long as they can take part on a fair and open basis. Our leading role in the European Space Agency will not change as we leave the EU, and this government will ensure the UK thrives in the commercial space age through our modern industrial strategy."